RPA is fast becoming a reliable way to trial automation without committing to a full-scale AI program. As the market grows, RPA is becoming a viable automation technology in its own right, and companies are beginning to demand more from . . . Fake news was the Collin’s word of the year for 2017 with good reason. In a year where politics-as-usual was torn apart at the seams, high-profile scandals rocked our faith in humanity and the extreme effects of global warming made themselves painfully known, it is becoming harder than . . .
Cyborgs are among us already. Not the human-weapon hybrids that exist in children’s imaginations and terrible horror movies, but a far more efficient variety that is mostly indistinguishable from non-modified humans. Advances in medical technology can help mitigate conditions that were . . .
Can We Make Artificial Intelligence Accountable? Lack of explainability of decisions made by Artificial Intelligence (AI) programs is a major problem. This inability to understand how AI does what it does also stops it from being deployed in areas such as law, healthcare and within enterprises . . .
Hurricane Florence may have been downgraded to a post-tropical cyclone as of 5 a.m. Tuesday, but the Carolinas are still reeling from one of the worst storms to hit the area in recent memory, with the death toll reaching 32, around 500,000 . . . Ask anyone: working with robots is the stuff of the future. But collaborative robots (cobots) are already well on their way to our workplaces, and this sector is now growing the fastest within the robotics industry. 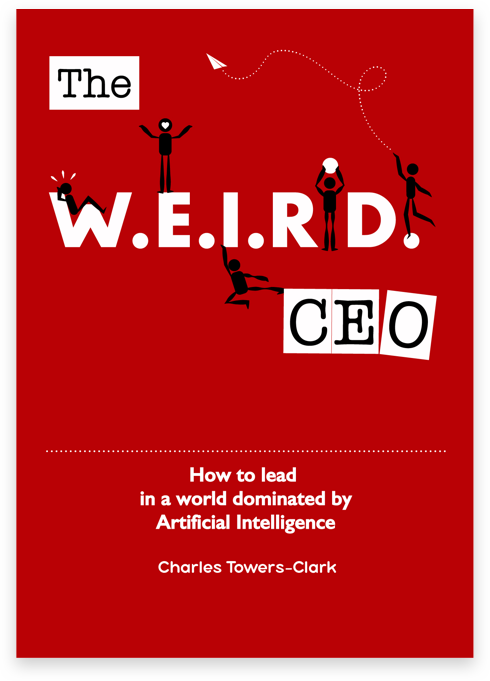 In The WEIRD CEO, Charles sets out the technological and societal changes that will take place over the next fifteen years, and explains why companies need to rethink the way they motivate employees. He outlines why CEOs and managers need to encourage Wisdom, Emotional Intelligence, Initiative, Responsibility and Development (WEIRD) to make sure employees feel fulfilment and ownership in their work – and gives a fascinating and sometimes brutally honest record of the change process his company went through. The WEIRD CEO explains how and why we need to change, in order to deal with a new working world dominated by Artificial Intelligence. Click on the book to get the introduction and first chapter for free! Sign up today and get the first chapter of the book for free. Leave your details below and we will email it straight out to you. Leave your details for WEIRD updates. Get The Book or Kindle Book Today! If you are asking yourself these questions: Why don't people enjoy the work they do? How will Artificial Intelligence destroy jobs as we know them? What can companies do to engage employees, whilst dealing with mass job destruction? Maybe it’s time for you to become a WEIRD CEO.